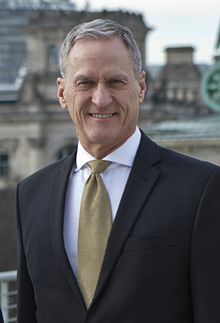 Dennis Martin Daugaard (/ˈduːɡɑːrd/; born June 11, 1953) is an American attorney and politician who served as the 32nd governor of South Dakota from 2011 to 2019. A member of the Republican Party, he was the first chief executive of a U.S. state to be the child of deaf parents. Before being elected governor, he was a lawyer, banker, development director for a nonprofit organization; he then served as a state senator from 1997 to 2003 and the 37th lieutenant governor of South Dakota from 2003 to 2011. Dennis Martin Daugaard was born in 1953 and raised on a family farm near Garretson, South Dakota, the son of Florence Margaret (Kennedy) and Raymond Victor Daugaard. Both his parents were deaf. (Such children are referred to as CODA, child of deaf adult(s), and a national interest organization for them was founded in 1983 because of their common issues as mediators between the deaf and hearing worlds.) His paternal grandparents were immigrants from Denmark. While Dennis Daugaard was growing up, his family's primary language at home was American Sign Language. Daugaard went to a local one-room country school as a child. For high school, he had to go to the city of Dell Rapids; there he played the French horn. He graduated in 1971. Daugaard attended the University of South Dakota in Vermillion where he was advised by William O. Farber. He graduated from USD in 1975 with a Bachelor of Science in government and from Northwestern University School of Law in 1978. Daugaard worked to pay his way through law school as an ASL interpreter, a bus driver, a law clerk and a security guard. Daugaard worked as an attorney in Chicago from 1978 to 1981 before returning to South Dakota. He married Linda that year and they have three children: Laura, who is married to Jay Mitchell; Sara, who is married to Tony Venhuizen; and Christopher, who is married to Emily Conway. Daugaard worked as an executive banker in Sioux Falls, South Dakota from 1981 to 1990. He then worked for the Children's Home Society of South Dakota, as Development Director from 1990 to 2002 and Executive Director from 2002 to 2009. Daugaard's first entry into electoral politics came in 1996, when he was elected to the South Dakota State Senate as a Republican. He remained a state senator until he was elected the 37th Lieutenant Governor of South Dakota in 2002 as the running mate of Governor Mike Rounds, a position he held for eight years. While serving in the state legislature, Daugaard said his priorities were helping children and the disabled, as well as reducing crime. Daugaard was elected lieutenant governor in 2002 and reelected in 2006. As a lieutenant governor, he served as the President of the South Dakota Senate. In addition, he served as the chair of the Workers' Compensation Advisory Council, which reviews and makes recommendations regarding South Dakota's worker compensation program. While lieutenant governor, Daugaard also fulfilled other duties assigned by the governor and delegated by the state constitution. He served as a member of a commission that dealt with state constitutional amendments and was chairman of a task force that considered options to reduce the number of South Dakotans lacking health insurance. In 2009, Daugaard promoted legislation to establish the South Dakota Ellsworth Development Authority to promote and manage economic development in Rapid City and other areas surrounding Ellsworth Air Force Base in western South Dakota. He has also promoted the Honor Flight program, which honors World War II veterans. In 2010 Daugaard ran for the Republican nomination for governor. He won the primary election against several other candidates. Daugaard chose Matt Michels as his running mate. His campaign was led by his son-in-law Tony Venhuizen. The Daugaard/Michels ticket beat Democratic nominees Scott Heidepriem and Ben Arndt by 61.5% to 38.5% in the November general election. Daugaard was the first child of deaf adults to be elected governor of any state. During his campaign, he stressed that he has often promoted issues affecting the deaf and hard of hearing, and is sympathetic to their children, most of whom are hearing, as he is. Daugaard and Michels were reelected in 2014. In 2011, Daugaard established the first Office of Tribal Relations in his cabinet, appointing J.R. LaPlante (Cheyenne River Sioux) as its Secretary. No other state government has such an office. LaPlante had a law practice in Vermillion, and had served as the "chief judge and court administrator for the Crow Creek Sioux Tribe in Fort Thompson. In addition, he had served as an administrative officer for the Cheyenne River Sioux Tribe." He worked with Daugaard to build government-to-government working relationships on issues such as "housing, economic development, public safety, and human services." He used mediation to resolve conflicts, for instance reaching agreement among state, county and tribal officials in Charles Mix County to recognize the Yankton Sioux’s historical presence in highway signage. In 2011, Daugaard appointed Dusty Johnson as his chief of staff. In 2014, he appointed his son-in-law and former campaign director Tony Venhuizen as his chief of staff. According to a Morning Consult poll conducted from May through September 2016, Daugaard was the most popular governor of any U.S. state, with a 74% statewide approval rating. In rankings published in July 2018, he was 5th most popular, with an approval rating of 61%. On October 23, 2018, Daugaard endorsed Kristi Noem for governor in the imminent election. ^ Schaffhauser, Erich (November 3, 2010). "Deaf Community Happy With Daugaard Win". Sioux Falls (S. Dakota) KELO-TV. Archived from the original on January 27, 2013. Retrieved July 6, 2012. ^ a b c d "First CODA becomes the Governor of South Dakota". Fookem and Bug. February 6, 2011. Retrieved July 6, 2012. ^ "Gov to Speak at NAD (National Association of the Deaf) Conference". Deaf News Today. May 15, 2012. Retrieved July 6, 2012. ^ joel.ebert@capjournal.com, Joel Ebert. "Governor has connection to audiology legislation". ^ a b "About Dennis". South Dakota. Retrieved June 21, 2012. ^ "The 2010 Results Maps". Politico.Com. Retrieved September 4, 2010. ^ "Here Are America's Least (and Most) Popular Governors". Morning Consult. September 2016. Retrieved August 11, 2017. ^ Easley, Cameron (July 25, 2018). "America's Most and Least Popular Governors -- July 2018". Morning Consult. Retrieved July 27, 2018. Wikimedia Commons has media related to Dennis Daugaard.